Phil Rosenthal created one of the most successful sitcoms of all-time, Everybody Loves Raymond. He was a bona-fide expert in his craft. And then ... the Russians called. 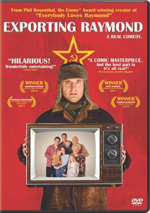 In the hilarious Exporting Raymond, a genuine fish-out-of-water comedy that could only exist in real life, Phil travels to Russia to help adapt his beloved sitcom for Russian television. The Russians don’t share his tastes. They don’t share his sense of humor. But what Phil did discover was a real comedy, filled with unique characters and situations that have to be seen to be believed. An audience award winner at multiple film festivals across the country, Exporting Raymond proves that even if you’ve never seen Everybody Loves Raymond, you’ll still enjoy this wildly entertaining film. $35.292 thousand on 13 screens. As the creator of Everybody Loves Raymond, Phil Rosenthal made buckets of money. Not content to sit around and count the cash, he decides to take his product and move it to another market. This leads him to Russia, where he attempts to adapt Raymond for the locals. And that allows us to follow the journey via this documentary. Exporting Raymond focuses on Rosenthal’s adventures as he sees Russia and deals with massive cultural differences. These lead to conflicts as he attempts to stay true to the source while they fit the series for the locals. That side of things becomes the most prominent element in Exporting: the culture clash and Rosenthal’s reactions. This means that we see a lot of shots in which Rosenthal simply looks appalled at what the Russians are doing to his series. I think Rosenthal probably plays to the camera a bit; I’m not sure he’d seem so broad if he’d not been filmed. To some degree, this makes Rosenthal the weak link in the documentary. He tends to come across as rigid and unwilling to understand that a series – especially a comedy, which is so rooted in specific cultures – needs to go through a lot of changes for different societies. I get that he thinks the themes and characters of Raymond are universal and don’t need much translation, but I still think he underestimates how much the comedy itself needs to change. Of course, we see Rosenthal’s evolution, which the film treats in a somewhat pat manner. He gets to know the Russians and eventually sees that we’re all the same even though we’re different. Exporting wraps up that sentiment awfully quickly; it goes abruptly from major problems on the set to “everything’s great now”. I suspect the latter viewpoint emerges largely because the Russian Raymond becomes a big hit; that’ll fix a lot of issues. The ending comes across as trite in the way it shows Rosenthal’s eventual comprehension of the system. Though Rosenthal can be an annoying guide, though, I think Exporting delivers an entertaining “fish out of water” story. The best elements revolve around the attempts to adapt the series – the real attempts to make it work, not just Rosenthal’s griping about changes. It’s fascinating to see the way the Russian TV system works and how they try to make American entertainment fit within their culture. Much of the movie concentrates on these issues, so much of Exporting works. Even with its various flaws, it remains an enjoyable ride. It gets into an unusual subject and moves briskly along the way, so I can forgive some of its missteps. Exporting Raymond appears in an aspect ratio of approximately 1.85:1; the image has been enhanced for 16X9 televisions. This was a generally bland presentation. Colors were mediocre. The program featured a natural palette, but the tones tended to be somewhat flat and undistinguished.. Blacks were acceptable, and shadows showed decent delineation. Overall, this was a watchable image but not anything above average. I thought the Dolby Digital 5.1 soundtrack of Stonehenge was a bit more involving than expected. Music showed good stereo imaging, and a few effects spread out across the front and rear. We got elements like a storm, street sounds, and other tidbits. These never turned the soundscape into a broad extravaganza, but they gave the movie a little more kick than I anticipated. Audio quality was fine. Speech sounded natural and concise, without edginess or other problems. Music seemed full and rich, and effects were good; they didn’t demand much of the mix, but they appeared accurate enough. This was a pretty nice track for a documentary of this sort. We get a few extras on the DVD. These start with an audio commentary from writer/director Phil Rosenthal. He offers a running, screen-specific look at the creation of the documentary and his experiences during the events we see in the film. The latter subject dominates the commentary, so don’t expect to learn much about how Rosenthal put together the documentary; he gives us a little information about that subject but not much. Instead, he provides a lot of context and additional information related to the situations/people he encountered in Russia. Rosenthal discusses the topics in a chatty, humorous style that works well. Really, he’s a lot more engaging in the commentary than he is in the film; he makes the chat informative and a lot of fun. Nine Deleted Scenes run a total of 11 minutes, 26 seconds. Most of these offer pretty brief and superfluous tidbits from Rosenthal’s trip; they’re interesting but fairly trivial. I do like the concerns about translations – that segments offers more understanding of the series’ adaptation challenges – and we get a bit more from the set. Some TV episodes appear next. We get two for Everybody Loves Kostya (24:25 each) and two for Everybody Loves Raymond (22:42 and 22:48, respectively). In a fun twist, both offer the same stories – “Baggage” and “The Family Bed” – so we can see the original and the Russian versions of the episodes. That makes their inclusion a great bonus. Under Old Jews Telling Jokes, we hear from Rosenthal’s father Max. In the one-minute, 16-second clip, the elder Rosenthal delivers a quick joke. It’s mildly amusing. A few ads open the disc. We get clips for Pom Wonderful Presents The Greatest Movie Ever Sold, Midnight in Paris, Community and The Big C. These also appear under Previews, and the disc throws in the trailer for Raymond as well. With Exporting Raymond, we get a generally intriguing look at an attempt to adapt American comedy for the Russian audience. It’s not always a smooth ride, but the documentary delivers enough interesting observations that it usually succeeds. The DVD provides average picture along with pretty good audio and a nice array of supplements. Though not a great documentary, this one has enough going for it to deserve a look.